Protologue: Bull. Mus. natn. Hist. nat., Paris, sér. 4, 10, sect. B, Adans., 2: 138 (1988). Abelmoschus esculentus auct. non (L.) Moench. West African okra, West African okro (En). Gombo ouest-africain, gumbo ouest-africain (Fr). The genus Abelmoschus originated in South-East Asia. West African okra, however, is a cultigen occurring mainly in West and Central Africa. It has been reported from Guinea to Nigeria in West Africa, in Cameroon, Gabon and DR Congo in Central Africa, and in Uganda in East Africa. Its distribution is restricted to humid and perhumid climates in Africa, between 12°N and 12°S, most commonly between 5°N and 10°N, whereas the common okra (Abelmoschus esculentus (L.) Moench) can be found worldwide throughout the tropics, subtropics and warm temperate regions. Young immature fruits are an important vegetable, consumed cooked or fried. In West Africa they are usually boiled in water to make slimy soups and sauces. Fruits can be dried, whole or sliced, and subsequently conserved. Before selling, the dried product is usually ground to a powder. Young leaves are sometimes consumed as spinach. There are no apparent differences in uses between West African and common okra. The extent to which the uses mentioned below apply to West African okra is unknown. Leaves are considered good cattle feed, but this is seldom compatible with the plant’s primary use for human consumption. 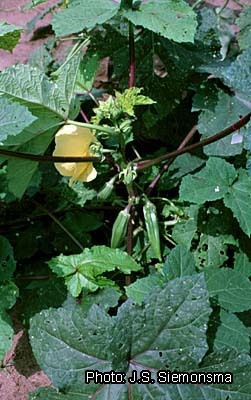 Okra mucilage is suitable for medicinal and industrial applications. It has been used as a blood plasma replacement or blood volume expander. Leaves are sometimes used as a basis for poultices, as an emollient, sudorific or antiscorbutic and to treat dysuria. Okra mucilage has been added as size to glaze paper, and is used in confectionery. The bark contains a fibre which is suitable for spinning into rope and for paper and cardboard manufacture. The fibre has been locally used for fishlines and game traps, but fibre harvesting is incompatible with fruit harvesting. Roasted seeds of okra are used in some areas as a substitute for coffee. World production of okra (both species) as fresh fruit-vegetable is estimated at 6 million t/year. Okra production in West and Central Africa is estimated at 500,000–600,000 t annually based on available consumption data. West African okra is estimated to make up half this amount, about 5% of total world production of okra. No studies suggest systematic differences in nutritional value between the two okra species. The composition of okra fruits per 100 g edible portion (81% of the product as purchased, ends trimmed) is: water 88.6 g (85.7–90.2), energy 144 kJ (36 kcal), protein 2.1 g (1.1–3.0), fat 0.2 g, carbohydrate 8.2 g, fibre 1.7 g, Ca 84 mg (55–142), P 90 mg, Fe 1.2 mg (1.1–1.5), ß-carotene 185 µg (180–190), thiamin 0.04 mg, riboflavin 0.08 mg, niacin 0.6 mg, ascorbic acid 47 mg (20–126). The composition of okra leaves per 100 g edible portion is: water 81.5 g (75.3–92.4), energy 235 kJ (56 kcal), protein 4.4 g (2.8–5.6), fat 0.6 g, carbohydrate 11.3 g, fibre 2.1 g, Ca 532 mg (258–635), P 70 mg, Fe 0.7 mg, ß-carotene 385 µg, thiamin 0.25 mg, riboflavin 2.8 mg, niacin 0.2 mg, ascorbic acid 59 mg (9–75) (Leung, W.-T.W., Busson, F. & Jardin, C., 1968). Carbohydrates are mainly present in the form of mucilage. That of the young fruits of Abelmoschus esculentus consists of long-chain molecules with a molecular weight of about 170,000 made up of sugar units and amino acids. The main components are galactose (25%), rhamnose (22%), galacturonic acid (27%) and amino acids (11%). The mucilage is highly soluble in water. Its solution in water has an intrinsic viscosity value of about 30. Okra seeds contain about 20% protein (similar in amino acid composition to soya bean protein) and 20% oil (similar in fatty acid composition to cotton-seed oil). The bark fibre is easy to extract. It is white to yellow in colour, strong but rather coarse. Tests conducted in China suggest that an alcohol extract of Abelmoschus leaves can eliminate oxygen free radicals, alleviate renal tubular-interstitial diseases, improve renal function and reduce proteinuria. Stout, annual to biennial, erect herb up to 4 m tall, mostly strongly branched; stem often woody at base, terete, glabrous or with scattered, stiff hairs, often red-blotched; branches erect to curved downwards. Leaves arranged spirally, simple, variable in shape and size; stipules filiform, up to 2 cm long, covered with stiff hairs, especially on the margins; petiole up to 60 cm long, often red-tinged, with a line of soft, simple hairs on the upper side, otherwise glabrous or with scattered, stiff hairs; blade transversally elliptical to orbicular in outline, up to 50 cm broad, length of midrib up to 35 cm, mostly 3-, 5- or 7-palmatilobed to palmatipartite, cordate at base, 5–9-veined, segments triangular, ovate, elliptical, obovate, oblong, spatulate or lanceolate, acuminate, serrate to crenate, sometimes entire or angular, veins on both sides with scattered, stiff hairs. Flowers axillary, solitary or racemose by reduction or abortion of the upper leaves; pedicel up to 4.5 cm long in flower, up to 13 cm in fruit, glabrous or with scattered, stiff hairs; epicalyx segments 5–10, free, ovate to oblong, 10–35 mm × 4–13 mm, acute to acuminate, generally persistent through early fruit development, covered with stiff hairs, especially on the margins; calyx spathaceous, 2–7 cm long, 5-toothed apically, usually splitting on one side at the expansion of the corolla, adnate to and caducous with the corolla and staminal column, sericeous outside, often mixed with short, simple and stellate hairs, strigose to sericeous inside; petals 5, free, obovate to orbicular, 4–9 cm long, base fleshy, apex obtuse to retuse, glabrous, yellow, often turning pink after anthesis, with a dark purple centre; stamens united into a staminal column up to 3.5 cm long, white, glabrous; ovary superior, tomentose, often with some stiff hairs on the costae as well, 5–12 style arms 3–5 mm long, stigmas dark purple, with simple hairs. Fruit an erect to drooping, ovoid capsule 5–25 cm × 1–5 cm, acuminate, terete to 5–12-angled, concave between the costae, gradually losing its original indumentum, when young varying in colour from purple-red and reddish-green to dark green, and from pale green to yellow, completely or partially loculicidal or not opening at all, up to 100-seeded. Seeds globose to ovoid, 3–5 mm in diameter, with minute warts in concentric rows, rarely with long red hairs on the seed coat. This taxon was described as a species in 1988 although it is only known from cultivated material. Classification as a cultivar-group might have been more appropriate. There are strong indications that Abelmoschus caillei is an amphidiploid of Abelmoschus esculentus (L.) Moench (2n = 130–140) and Abelmoschus manihot (L.) Medik. (2n = 60–68). However, the latter species has not been found with certainty in the area of distribution of West African okra, and isozyme analysis has neither confirmed nor rejected the relationships. Abelmoschus manihot differs from Abelmoschus caillei by a smaller number of epicalyx segments (4–8), and much smaller fruits (3.5–6 cm long) which are inedible because they are covered with prickly hairs. Abelmoschus esculentus differs in several respects from Abelmoschus caillei, but the epicalyx offers the best discriminating characteristic: the width of the epicalyx segments is 4–13 mm in Abelmoschus caillei and 0.5–3 mm in Abelmoschus esculentus. The two okra species can be quite reliably (but not with absolute certainty) recognized on the basis of fruit form. Fruits of Abelmoschus caillei are ovoid, whereas fruits of Abelmoschus esculentus are cylindrical to pyramidal. The list of synonyms shows that information related to Abelmoschus caillei has often been attributed to Abelmoschus esculentus and/or Abelmoschus manihot, thus literature has to be interpreted with care. Under the conditions of southern Côte d’Ivoire (5°N), West African okra flowers within 50–110 days after sowing in the dry season (sowing in October: days shortening) and within 65–270 days after sowing in the rainy season (sowing in March: days lengthening). Short-day types, planted at the beginning of the rains (March), do not flower by the end of the rainy season (November), but are vegetatively so well-developed that they easily survive the dry season without supplementary water, and flower and bear fruit in a period of scarcity. In African languages, West African okra is therefore sometimes referred to as ‘late okra’ or ‘dry-season okra’. Crop duration thus shows enormous variation depending on cultivar, locality and season, and varies from 4 months to well over 12 months. Comparing cultivars of similar earliness, it is striking that West African okra has a considerably longer productive period than cultivars of common okra. This is an attractive feature for home garden planting. Flower opening and pollination take place in the early morning. Although basically a self-pollinated crop, considerable cross-pollination by insects may take place. For vegetable use the fruits are picked about one week after anthesis. The regular removal of young fruits permits sustained vegetative growth and flowering, prolonging the productive period. In a seed crop, it takes about one month from anthesis to fruit maturity. In this case, vegetative growth stops soon after anthesis, all assimilates being diverted to reproductive parts. Many local types show a qualitative short-day response even at a latitude of only 5°, the shortest critical daylength reported being 12 hours 15 minutes. Even at this latitude, vegetative periods of 8–9 months occur when sown under the ‘long-day’ conditions of the rainy season. Apart from these qualitative responses, most local types show quantitative short-day responses. West African okra is, therefore, not suitable for semi-arid and arid regions beyond latitudes of 12°N and 12°S because of daylength requirements. West African okra tolerates a wide variety of soils but prefers well-drained sandy loams, with pH 6–7, and a high content of organic matter. Most farmers harvest seed from their own local cultivar or rather heterogeneous landrace. The easiest way to keep the seed is to leave it in the pods. Seed weight varies from 30–70 g/1000 seeds. Prior to sowing the seed is often soaked in water to soften the hard seed coat. It is usually dibbled directly in the field (1–3 seeds per hole). The robust West African okra should be grown at 20,000–50,000 plants/ha. Emergence is within one week. When the plants are about 10 cm tall, they are thinned to one plant per hole. 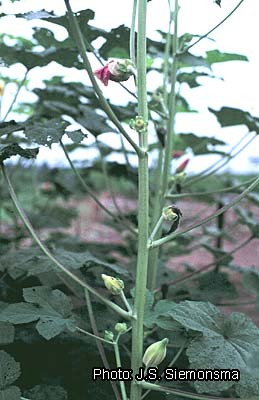 Commercial okra growers usually practise sole cropping, and prefer the early, homogeneous, introduced cultivars of common okra (Abelmoschus esculentus). In traditional agriculture, farmers grow their okra landraces in home gardens or in fields with other food crops. The landraces often consist of a mixture of Abelmoschus caillei and Abelmoschus esculentus, the former being predominant in humid climates, the latter in drier climates. The uptake of minerals is rather high. Indicative figures for total nutrient uptake per ha of a crop with fruit yield of about 10 t/ha are 100 kg N, 10 kg P, 60 kg K, 80 kg Ca and 40 kg Mg.
West African okra is more tolerant of diseases and pests than common okra. An exception is vascular wilt (Fusarium oxysporum), which in West African okra has more time to manifest itself due to the longer crop duration. Other serious fungal diseases of okra in West Africa are damping-off (Macrophomina phaseolina) and Cercospora blight (Cercospora abelmoschi). Oidium abelmoschi is more important in the drier climates. Okra mosaic virus (OkMV), transmitted by flea beetles (Podagrica), is widespread but damage is much less important than that caused by leaf curl, transmitted by whitefly (Bemisia tabaci). These viruses must be controlled through control of the vectors. Nematodes of the genus Meloidogyne constitute a major problem. Damage by nematodes is avoided by crop rotation, e.g. with Guinea grass (Panicum maximum Jacq.) or cereals, and by large applications of organic manure. Insect damage is mainly due to the cricket Brachytrupes membranaceus, to Podagrica flea beetles, to the bollworms Earias biplaga and Pectinophora gossypiella, and to the beetle Anomala denuda. Chemical control of insects is hazardous because crop harvesting is frequent. The earliest types of West African okra are ready for first harvest at 8 weeks after sowing. Developing fruits should be harvested when 7–8 days old. Earlier picking depresses yields because of low fruit weight, but delayed picking depresses marketable yields because over-aged fruits become fibrous. Okra fields are, therefore, harvested at intervals of 2–3 days. The minimum frequency is once a week but then fruits of all sizes have to be picked. Although such a low frequency reduces yield, the very small fruits can fetch a higher price, being of prime quality. For seed production, the whole crop can be harvested once-over. Intensive contact with the slightly hairy fruits and plants may lead to skin irritation. A vegetable yield of 10 t/ha can be considered a good harvest, but yields of over 40 t/ha can be realized under optimal conditions. Yields are usually low (2–4 t/ha) as a result of non-intensive growing methods. Seed yields are in the range of 500–1000 kg/ha. Fresh okra can be transported quite easily in bulk and kept for a few days without much loss of quality. Dried okra is an important product in West Africa. Local landraces are not at great risk of genetic erosion at present. Only commercial growers tend to switch to commercial cultivars of Abelmoschus esculentus, whereas Abelmoschus caillei is ubiquitous in subsistence farming. Substantial germplasm of West African okra is maintained by CNRA (Centre National de Recherches Agronomiques) in Bouaké (Côte d’Ivoire) and by IRD (Institut de Recherche pour le Développement) in Montpellier (France). Many national collections contain both okra species, curators often not being aware of the difference. West African okra has already been introduced into several American and Asian countries for research purposes through germplasm exchange. 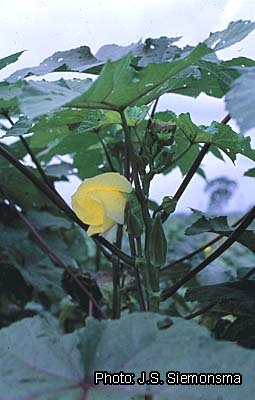 West African okra is reported to be resistant to yellow vein mosaic virus (YVMV), a major cause of crop failure of common okra in Asia, whitefly (Bemisia tabaci) being the vector. Selection and breeding of West African okra have not been carried out by the commercial sector, but African farmers have selected an enormous diversity of forms which fit into a great variety of cropping systems. There is, however, plenty of scope for combining desirable characteristics in cultivars for the traditional sector (where hardy, robust, long-lived types are required) as well as for the commercial sector (where good alternatives for introduced cultivars of Abelmoschus esculentus are needed with better adaptation to local conditions, diseases and pests in particular). Nevertheless, isozyme analysis has shown a rather low level of genetic diversity in cultivated okra in spite of much phenotypic variability. The characteristics of both okra species open up new opportunities for recombination. They cross readily in both directions and crosses result in vigorous hybrids; these, however, show a marked reduction in fertility. Nevertheless, seed is formed by interspecific hybrids under conditions of open pollination, probably due to backcrossing with fertile pollen of one of the parental species. Abelmoschus esculentus ‘Parbhani Kranti’ was bred in this way in India, with YVMV resistance/tolerance derived from Abelmoschus caillei. Although they occur together in farmers’ fields, the genetic integrity of the two okra species is largely assured because chances are very small that the unproductive F1 hybrids will be selected as seed sources for the next crop. Okra will remain a welcome, productive fruit-vegetable. The relatively recent discovery that West African okra is different from common okra offers new possibilities in an old crop. Siemonsma, J.S. & Hamon, S., 2004. Abelmoschus caillei (A.Chev.) Stevels. In: Grubben, G.J.H. & Denton, O.A. (Editors). PROTA (Plant Resources of Tropical Africa / Ressources végétales de l’Afrique tropicale), Wageningen, Netherlands. Accessed 12 April 2019. This page was last modified on 28 April 2018, at 19:32.